Read Colossians 3:23-24. “Work willingly at whatever you do, as though you were working for the Lord rather than for people. Remember that the Lord will give you an inheritance as your reward, and that the Master you are serving is Christ." Did you need today’s nudge? If so, let Gwen come along side of you on a fresh faith adventure. 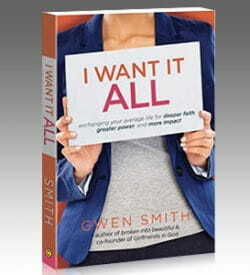 I WANT IT ALL is a book filled with relatable stories, Scriptural depth, and practical points for personal application.And it has a Bible Study guide included in the back! Order yours today from Amazon, or get a signed copy from her website.